The development of Habitech's innovative modular building components has been driven by a 'cradle-to cradle' mindset - refining a system that can ultimately become truly sustainable in having a positive environmental impact. Our wall system currently works to take carbon out of the atmosphere and locks it up in the base materials we so efficiently use to construct a building. Ultimately we want to work towards capturing nutrient cycles within sustainable plantation forestry. With this long-term goal in mind, it is no coincidence our system is based on a modular, flat-packed solution. Habitech's system has been developed considering the most efficient scale of manufacturing building elements. We create the structure and outer shell of a house with a series of high-quality manufactured components. 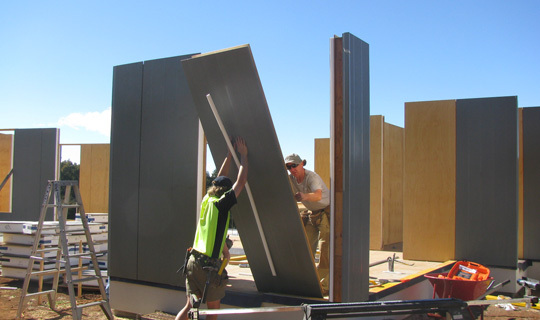 Our innovative modular wall panels draw on proven Structural Insulated Panel (SIP) technology performance. 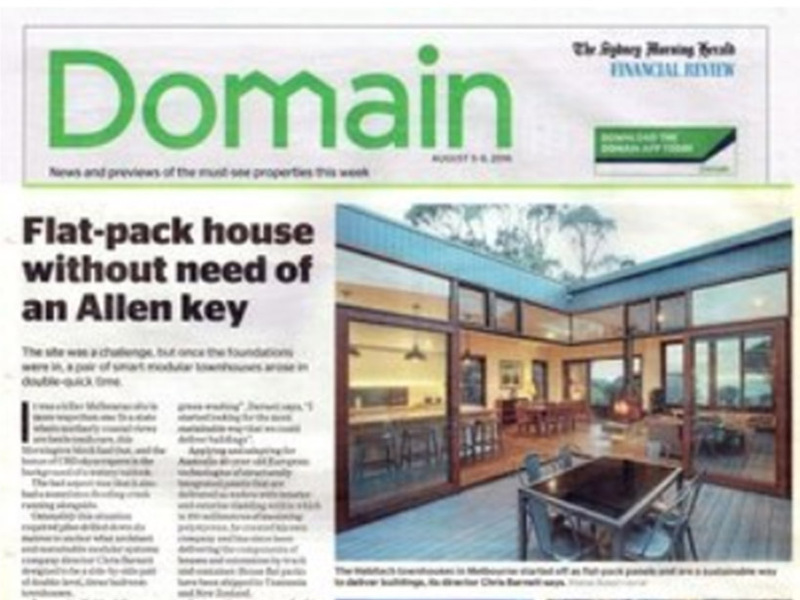 We have refined this technology further specifically for the Australian climate and building industry. >> Learn more about Habitech's technology. With over 20 years of experience in sustainable architecture and ESD consulting, we understand the benefits of high performance houses. Habitech's approach focusses on delivering our components to create super-strong and super-insulated houses - offering our clients next-generation sustainability performance. Designed to get a house weather tight and secure quickly, our sustainable building system is efficiently constructed. Wall panels – structural wall panels that include a full cladding system and deliver R 4.3 insulation - in place and without the thermal bridges and air gaps of traditional 'bricks & sticks' construction. Doors and windows – we deliver a timber framed window as a standard, but are able to work with any window manufacture to fit the desired quality of doors and windows you may wish to use in your house. Habitech integrates energy efficiency building services into our houses from the design stage, commonly using Heat Recovery ventilation systems as the basis to providing and distributing fresh, conditioned air throughout the living spaces we create.